Our thanks to Molly Kilpatrick and Andrew Dolloff for sharing the excitement about Charlotte's new book, Maybe Tomorrow? We cannot wait to get copies of this book in our hands. We will keep you updated on the release date! I wanted to share some happy HMS/YES news! Our very own Charlotte Agell has written another amazing book that will be released in March with Scholastic. If you haven't yet seen her book preview, you can watch it here. I've had the honor of previewing this story while it was still a draft and it's truly a work of art. Ana Ramirez Gonzalez, who also worked on the film Coco, illustrated Charlotte's story. Even though it's a picture book, the message applies to children of all ages, including adults! Please take a look at Charlotte's website for more about this beautiful work of art. There are so many amazing accomplishments in our schools - by both staff and students - it is hard to single out one individual or group of individuals for fear of leaving others out. 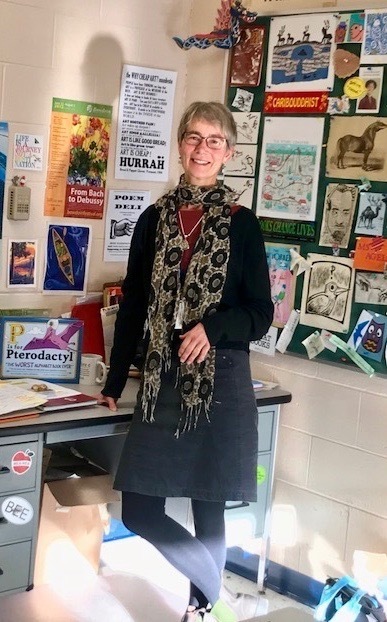 I do want to recognize one of our talented staff members today, though, as Charlotte Agell has once again published a children's book that is sure to draw rave reviews from children and parents. You can watch a preview of Charlotte's book, Maybe Tomorrow? here. If you have young children, I encourage you to get a signed edition forhome. If you are fortunate enough to run into Charlotte at HMS or YES, you may be able to convince the author to take a selfie with you, to further impress your kids.